Doing a day trip to Loch Ness involves an early start and a late return when you're going from Edinburgh, as it's pretty far away! A day trip wouldn't normally be my first choice (but this was too good an opportunity to pass up under circumstances), as I'd really like to do a sort of extended road trip through the Highlands, to avoid so much driving time. We left from the Royal Mile at 8am, and returned at around 8pm that night. The bulk of the day was spent driving, but at least Scotland has some gorgeous scenery to admire out the window along the way. The bus driver was also the tour leader, and spent a lot of the drive up telling us about what we were seeing, and stories about Scottish history. Many of these I already knew, being Scottish, such as the Battle of Stirling and Mary Queen of Scots's life story, but others were new or gave me details I hadn't known previously, like Rob Roy's life story. There was plenty of folklore thrown in for the tourists, like kelpies and haggii! We stopped off in a tiny town on the way up, for a bathroom and coffee break, or breakfast for some folks. There wasn't much to see or do there, just half a dozen other coaches parked outside the same shop and cafe (which must get great business from them all!). The most exciting part of the drive up, for me, was when we reached Glencoe. 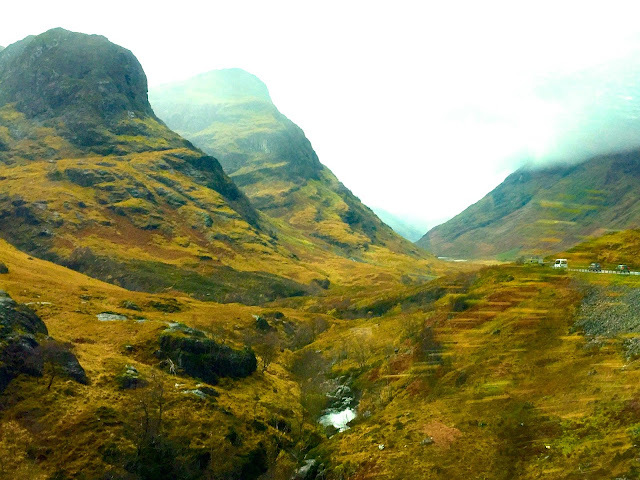 This is a well known valley in the Highlands, most famous for being the location of the Glencoe Massacre. The Highland clans were all required to sign oaths of loyalty to King William III, but the MacDonald clan were four days late in signing. The Campbell clan, who had sworn their loyalty, went to visit the MacDonalds, and were welcomed as guests, as Highland tradition demands. The Campbells stayed for several days, before finally committing the massacre they'd been ordered to carry out, as the MacDonalds punishment, and even today some pubs and restaurants in the area refuse to serve anyone with the surname Campbell. Despite it's bloody past, the valley is breathtaking to drive through, with the huge, rugged mountains towering on either side of the road. This isn't the fastest route from Edinburgh to Loch Ness, but I was definitely glad to have finally seen Glencoe, and it meant we saw different things on our different routes up and down. The coach stopped off at the Three Sisters, three particularly impressive hills in the middle of the valley, so we could hop off and take photos. It was a fairly overcast day, but it still looked pretty spectacular, and the mist makes it all quite eerie and atmospheric. Scotland may be beautiful, but it's not known for its sunny weather unfortunately. 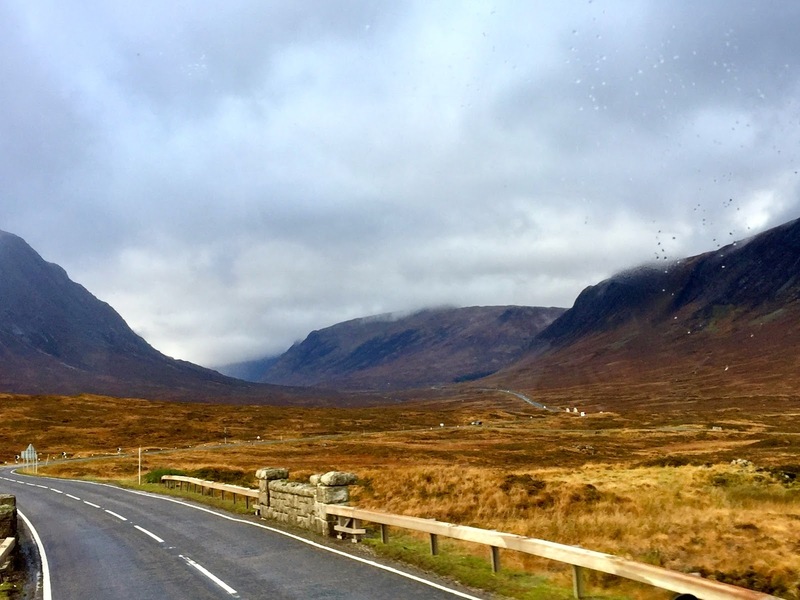 From Glencoe, we could also then follow the Great Glen up through the country, a natural fault through the hills, where four lochs have been connected by a network of canals, allowing boats to travel up the country. These are Loch Linnhe, Loch Lochy, Loch Oich, and Loch Ness, and both ends of the network feed into the sea, essentially bisecting the country. The lochs, canals, and their bridges all made for some interesting sights out the bus windows, and the colours of the autumn leaves were also looking particularly vibrant! We followed the lochs north, until we reached our destination of Fort Augustus, a town on the southern tip of Loch Ness. Because of the driving time required for this day trip, we arrived around 1.30pm, and would be leaving again just after 3pm. The bulk of this time would be spent on the boat cruise on the loch itself, but I had a little time to look around before it departed. The town didn't seem to have much to see itself, but there was a system of locks where the canal feeds into the loch, which was pretty interesting to have a look at. I walked along the shore of the loch a little way too, where there was a great view of it stretching away into the horizon. Once on the boat, I chose a seat downstairs, as it was pretty cold outside in the wind. There was some commentary on the boat, explaining facts about the loch - it's mind boggling actually, just how big it is. In our hour long cruise, we only sailed around a small section of it - the water disappeared into the horizon, lost from view, as the loch is over 20 miles in length. It also carries more water than every body of water (lakes, reservoirs, rivers, and everything else) in England and Wales combined. So you can see how it would be possible for a monster to be hiding down there. 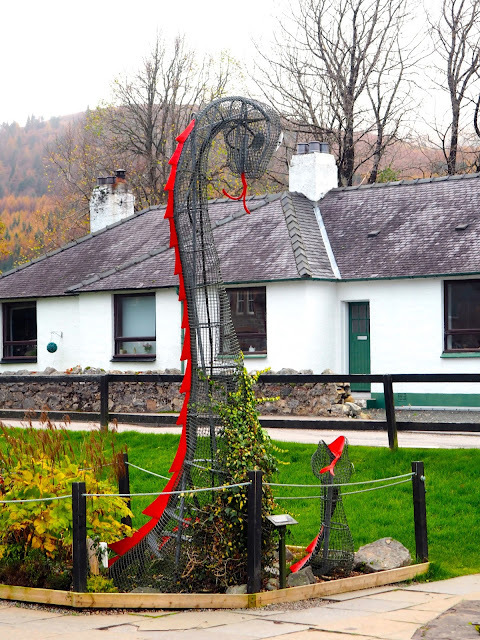 Of course, that's the main reason Loch Ness is so popular with tourists. For the first part of the trip, we just enjoyed the views, and kept our eyes glued to the surface of the loch, searching for anything that could be Nessie. On the return journey, one of the crew came downstairs and showed us a sonar device they had on board, and talked about the theories about the Loch Ness Monster with us. 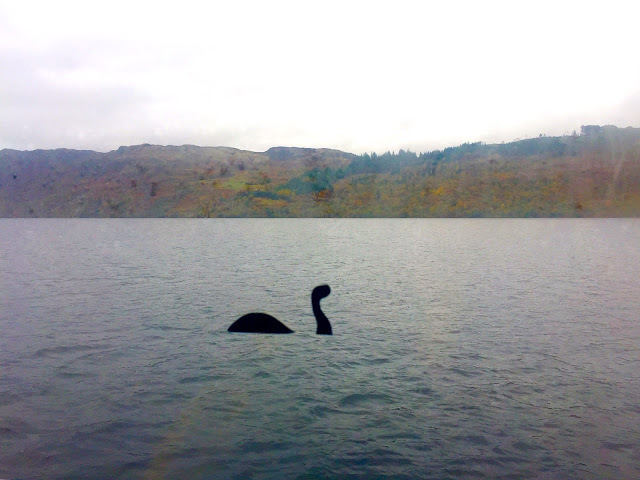 Loch Ness is up to 300m deep in places, and the water is saturated with peat from the surrounding ground, making it black in colour. Sunlight can only reach a few metres down, so the loch is never warmer than 5 degrees, and is pitch black, so sonar is the only way to get an idea of what's down there. Many locals have stories and experiences about monster sightings - this crew member had seen something on his fish finder that was much, much larger than any other fish in the loch! Unfortunately I didn't see anything on this trip - it would be unlikely to on my first visit, when there are people who've been going for years or live there, and have never seen anything - but the boat did have funny little monster silhouette stickers on the windows, so you could take a trick photo! We returned to shore, and headed back on board the bus to start our journey south again. This time, we took a different route, down through the Cairngorms, and the driver didn't talk as much, giving everyone the chance to take a rest, as this is a long day trip. Sure enough, I fell asleep for large portions of this journey, and as it's coming into winter time, the sun sets around 5pm now, so it was too dark to actually see much on the way back. We made a stop on the way down again, in a little town called Pittlochry. This is quite a popular weekend getaway, especially for people coming up from Edinburgh, Glasgow, or the Lowlands. However, at 6pm in the dark and freezing cold, it was hard to really see what the fuss was about. We only had half an hour, so not really time to get dinner, but there were cafes and shops, a chippie, and a pub. I was pretty quick to jump back on the bus though, as I was tired and cold by this time of day! The other point of interest on the way back was the Queensferry Crossing. This is the newest of the three bridges spanning the Firth of Forth, connecting Edinburgh to Fife. Each bridge was built in a different century - the Forth Bridge in the 19th, the Road Bridge in the 20th, and now the Queensferry Crossing in the 21st. It was a big deal when the Crossing was finished, with the Queen coming to open it, and people entering to win tickets to be amongst the first to drive across it. Traffic on it has been terrible though, with the speed limit only recently going up to 50mph, and so many people coming to drive across it just for the sake of it in the first few weeks of it opening. The old road bridge is reopening again for public transport though, to ease congestion. I had never been on or even seen the new Crossing, so this was a little exciting for me. It's quite different to have something white next to both the other red bridges! I could only see so much in the dark, but both other bridges were visible on the left, and the massive cables on the Crossing couldn't be missed! Overall, I'm happy to have finally seen places like Glencoe, Loch Ness, and the Queensferry Crossing, but I'm not sure I'd recommend a day trip as the best way to do them. If you're only in Scotland for a limited amount of time, it's a good option, and you cover a lot of ground in 12 hours. It's a lot of time to be sitting on a bus though, and even though the landscape is beautiful, it gets a little boring and tiring on the bus. I definitely want to see more of the Highlands, but I'd definitely want to do it as a longer trip, perhaps spending a week or two travelling around some of the other famous sights, and going to some of the Islands too.